MOORESTOWN—Tucked in the back of a shared parking lot off of Mill Street, InTown Auto Care is comprised of a bustling set of garages and an office that operates like command central. Formerly known as Ed Ebert’s, the repair facility’s new owners Suzanne and Mike Dunn have been putting their own stamp on the well-established business since they purchased it from its namesake almost four years ago. Now long-time as well as first-time customers are experiencing brand new upgrades and a heightened focus on customer service. The pride the Dunns place on these professional and personal touches, as well as a commitment to community service, caught the attention of the MBA board, which presented InTown Auto Care with an MBA Spotlight Award on March 1. The Dunns go above and beyond when it comes to customer service. They go to great lengths to make sure customers understand what needs to be repaired and why. After hours, the shop’s phone is forwarded to the Dunn’s personal number so customers can always reach them, because no one knows or plans when their vehicle will have a problem. InTown Auto Care offers rides to and from home while cars are in the shop, have a loaner car for customers who need it, and keep bicycles on hand for those who want to get around while they’re waiting for their cars to be serviced. They have helped customers find auto care for their cars while they are traveling, provided rides for medical treatment when vehicles are being repaired, secured after-hours emergency automobile assistance, and Suzanne has even transported a pair of Rottweilers home when their owner’s car broke down. It’s all in a day’s work. Since they took over the business, the Dunns have invested in significant equipment, technology, and tool upgrades, and the business is now completely computerized so they can provide precise and timely information. A state-of-the-art digital inspection system is their newest upgrade, allowing them to evaluate 32 points on each car arriving for an oil change and check-up. They provide digital photos of items needing attention, allowing customers to see and understand what the technicians are recommending. InTown Auto Care specializes in German cars, but provides expert care for all makes and models. The Dunns take pride in a staff that performs outstanding work, and are meticulous about making sure each employee is involved in continuing education as the industry evolves. Their hard work and attention to detail shows, and in 2016 they were one of 16 businesses in the state (one of only two in South Jersey) to be presented with a New Jersey Small Business Development Center Success Award. Situated in the heart of town, the Dunns also find it meaningful to participate in organizations aiming to improve Moorestown. They are active Rotarians and MBA volunteers, assist local charities like Kennedy’s Cause, and even buy cases of Girl Scout cookies and hand out boxes of the treats to their delighted customers. InTown Auto Care is the main sponsor for the Moorestown Robotics Club, and Mike is scheduled to talk about automotive technology to its young members. The business also adopts families at Thanksgiving and Christmas, and is a big supporter of Relay for Life and Carz N Toyz events. 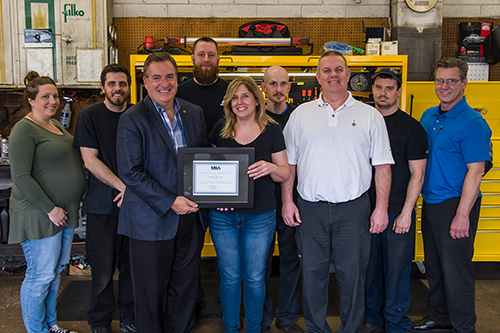 The MBA is pleased to recognize InTown Auto Care for its commitment to providing excellent service, improving and expanding its business, and for making community involvement a priority. Moorestown Business Association launched its Spotlight program in 2015 as a means to highlight local businesses that have had a positive impact on the community. Photo: MBA President Steven Pazienza presents a certificate of recognition to Intown Auto Care owners Suzanne and Mike Dunn and their staff, Stephanie, Joe, Kevin, Scott, Matt and John.